Singing Waiters Ireland by Singers for Hire are the original Irish singing waiters. From our cosy office in County Limerick we have been supplying internationally acclaimed singers to events across Ireland and the UK since 2002. These hand-picked singers and entertainers have entertained at spectacular events and parties across Europe, in America and the UAE. Our partners opened a Sydney office in 2010 bringing Singers for Hire’s unique surprise musical recipe to Australia and New Zealand. The original Singers for Hire are still part of the team. 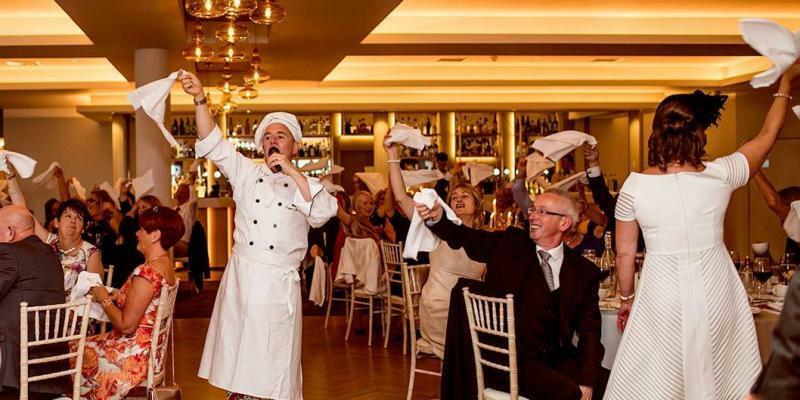 The award-winning solo entertainer Marco “The Singing Chef” remains the most popular wedding dinner entertainment act in Ireland. Never happy just to sit back and relax we are constantly improving and updating our singing waiter and dinner entertainment shows. We want to bring you the very best wedding and corporate event entertainment available. 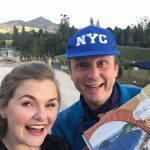 Singers for Hire were the first company in Ireland to introduce the Opera Singing Pizza guy and our hilarious singing waiter wedding videographer. While our competitors try to copy our shows, their pale imitations are always years behind our fresh and innovative approaches. Our singers are never happy just to present the same show time and time again so we are always rehearsing and innovating. In order to bring you exciting new surprise scenarios and to make your wedding day special and unique. Singers for Hire’s latest shows include our Disney singing waiters. This features hits from Beauty and the Beast, Toy Story and the Jungle Book with “Gaston” the Singing Sommelier. Also new an “untimely proposal of marriage”. Guaranteed to leave all your guests scratching their heads and then smiling with joy and pleasure as these Irish singers in disguise burst into song. We never forget that our clients are looking for family friendly wedding entertainment from Ireland. All our performances are always suitable for all audiences. They only include songs that everyone knows. We understand that an Irish wedding is different to an English or Scottish wedding or indeed a wedding in Dubai or Abu Dhabi. Our aim is to have everyone involved in your show with their hands and napkins waving. We want them singing along to classic songs such as “That’s Amore”, “Sweet Caroline” and “You’re Just Too Good to Be True”. Just three of the songs which have made our Singing Waiters Ireland so popular. All our musical arrangements are professionally written. The accompaniment tracks have been specifically recorded for our singers. Singing waiters Ireland provide all our own sound equipment and audio engineers as appropriate to guarantee a flawless performance. We pride ourselves on never, ever cancelling a performance for any reason. The Singers have gone days early, driven, flown and walked through snow storms, hurricanes and flooding. All to guarantee we are at your party even on the times when the host and guests didn’t make it. When you book Singers for Hire you book the best, professional singers vocalists. Singers normally only experienced on international stages and in top Broadway shows. Up close and live. Whether you are getting married in a five-star Dublin Hotel, a cosy Cork boutique, a barn on the Wild Atlantic way in Galway. Regardless if it’s in Mayo or Kerry, at an international golf club in San Francisco, the penthouse of a Dubai skyscraper, on the beach in Italy or in a marquee at the Sydney Opera house; Singers for Hire have entertainment to make your special day an incredible party spectacular.